No one underestimates the threat ISIS poses to humanity, but with each new attack, the reach of its terror only seems to grow. And today, ISIS showed the world that it’s still a force to be reckoned with, because the Islamic State just officially won Comic-Con with an incredible panel moderated by Chris Hardwick. There’s no way to sugarcoat this: This is one of ISIS’s most depraved attacks yet. In an act that’s sure to send shockwaves across the globe, ISIS delivered a truly buzzworthy hour-long panel to a packed Hall H, expertly moderated by comedian Chris Hardwick. The terrorist organization’s all-star lineup included leader Abu Bakr al-Baghdadi, spokesman Abul-Hasan al-Muhajir, minister of war Gulmurod Khalimov, and Shura council head Abu Arkan al-Amiri, who made one hell of a first impression with their triumphant entrance to the soaring strains of Queen’s “We Are The Champions.” What followed was electrifying for the crowd and truly terrifying to decent people everywhere. Absolutely horrifying. It looks like ISIS will stop at nothing in its war against the West. Within minutes, it was devastatingly clear that the ISIS panelists were total showmen who knew exactly how to work a Comic-Con audience. When the event seemed to be getting off to a rocky start thanks to al-Muhajir’s malfunctioning microphone, the extremist militant quickly spun it into comedic gold by playfully hijacking Hardwick’s mic and demanding ransom for it. Later, Hardwick goaded Khalimov into showing off his spot-on impressions of deceased ISIS spokesman Abu Mohammad al-Adnani, Jihadi John, and other ISIS fan favorites, winning a standing ovation from the crowd and sending the Talking Dead host into spasms of uncontrollable laughter. 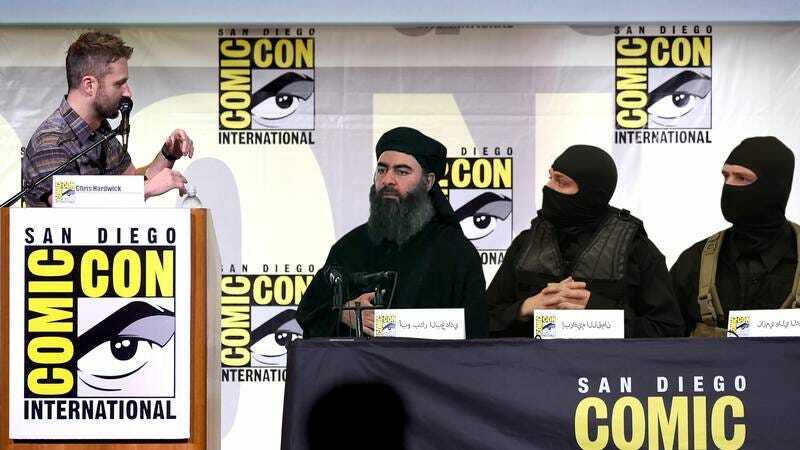 It was clear even from these early moments that ISIS had completely dominated Comic-Con and had established this as the most charming, popular event of the whole convention with an absolutely appalling combination of humor and charisma that had everyone in Hall H cheering. Although ISIS turned in a gut-churningly winning performance, one of the panel’s major highlights was definitely Hardwick. From good-naturedly roasting al-Baghdadi for losing control of Syrian city Dabiq to turning a riff on Sharia law into a blistering string of “stoning” puns, Hardwick was in rare form, giving a master class in showmanship that helped make even the clunkier ISIS speakers sound like pros. And while ISIS’s panel was mostly filled with laughs and lighthearted conversation, Hardwick wasn’t afraid to get real either: At the comedian’s gentle insistence, al-Baghdadi finally opened up about the recent death of his third-in-command, Abu Khattab al-Tunisi, in a legitimately touching moment that we condemn in the strongest possible terms. There’s absolutely no doubt that ISIS’s brutally entertaining conversation was the most beloved event at Comic-Con. Other popular events like the Battlestar Galactica cast reunion and the teaser trailer for Marvel’s much-anticipated Avengers: Infinity War were completely overshadowed by the wit and charisma of the Islamic State group. By the end of the day, all anyone at Comic-Con could talk about was ISIS. This was a complete and total victory for its campaign of terror. By the time the dust settled on the Islamic State’s panel, there were just too many highlights to count. Attendees were treated to not only a preview of the Islamic State’s newest propaganda video but also a thrilling supercut of the most memorable moments from the organization’s more than decade-long run. And while Comic-Con Q&A’s can be dicey affairs, Hardwick ran a tight ship, giving shout-outs to particularly great cosplayers (we see you, The Walking Deadpool!) and laughingly promising to cut the mic on anyone who bored the crowd by asking if this was the year we’d finally see ISIS attack the Vatican. “Guys, it’ll happen when it happens,” said the veteran podcaster in a flawless deadpan. While ISIS’s incredible Comic-Con panel is finally over, the world is still holding its breath as it waits to see the full impact of this latest attack on the West. Any hopes of containing the chillingly entertaining discussion have been utterly dashed, as Hardwick has already announced plans to release the audio for streaming on his Nerdist Podcast, and clips of the panel from attendees who snuck-recorded iPhone videos are already circulating widely on YouTube. For now, all anyone can do is hold their loved ones close and pray that a horrible attack like this never happens again.